In 1921, the NFL’s second season ever season saw its first ever major controversy. There were several major flaws in the early NFL, so early in fact the the NFL was still the APFA, chief among which was there was no central schedule. Teams were largely responsible for devising their own schedule, with no restrictions on who they could play. Teams didn’t have to even play NFL affiliated teams, little consideration was given to gaps between games or even a start and end dates of the season. The way in which the early APFA/NFL decided its title was also a little dubious to say the least. Standings were decided by winning percentage in much the way they are now with one crucial difference, ties didn’t count towards the standings at all. The league championship was then handed out after a vote of all the leagues owners factoring in the standings at the season ending meeting. If you are a Bears fan and you don’t know who the Decatur Staleys or the Chicago Staleys are then you’re either new to the Bears or you need to read to read more about their history because they are the Chicago Bears. The Bears didn’t receive their name until 1922 in homage to their landlords at the time the Chicago Cubs. The 1921 Season came down to two teams. 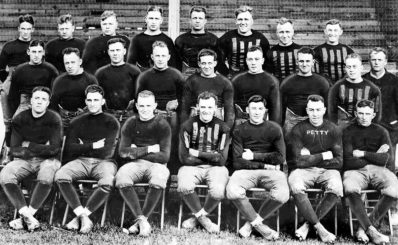 The Buffalo All-Americans owned by Frank McNeil, had finished their schedule on December 3rd with a record of 9-0-2 (1.000) ahead of the then Chicago Staleys owned by George Halas 7-1 (0.875) their solitary defeat losing 7-6 at the hands of Buffalo in a thanksgiving day match-up. There were some controversies around the All-Americans earlier in the season, that caused several of the All-Americans to walk out on the team. In Philadelphia Blue Laws prevented Sunday working so football games were played on Saturdays or Weekdays. Several of the All-Americans took it upon themselves to play for teams affected by this such as the Union Quakers of Philadelphia one day before travelling to Buffalo to play on the Sunday. In November 1921 the Quakers were due to play the APFA affiliated Canton Bulldogs, Frank McNeill raised a complaint with the league, his players were going to be playing against APFA opponents probably to the detriment of his own team who played the following day. McNeill’s complaint to the league resulted in the Bulldogs cancelling the game. Forced between a choice of the Union or the All-Americans the players involved chose to play for the Union instead. Suddenly without half a team the All-Americans were able to restock the their roster from the very recently defunct Detroit Tigers. The freshly restocked Buffalo “finished” the season on the 3rd of December 1921 in a fierce game against the previous years champions the Akron Pros winning 14-0. Their record at the time was 9-0-2. The All American’s has played every game at home that season, as one of the better supported teams it was often more profitable for teams to get the visitors share of the gate than to have stage their own games. Similarly the Chicago Staleys has only one away game in the 1921 season, their visit to Buffalo. This is where the “swindle” began. Staleys owner George Halas phoned McNeill and challenged the All-Americans to a rematch at Cubs Park on December 4th, the day after their hard fought victory over the Pros. McNeill was keen to state that they would play the game on the condition it be considered a post season friendly. Halas accepted the terms and the match was scheduled. To reinforce the point prior to the game McNeill told several Buffalo press outfits that game was an exhibition. Even further the players that refilled the roster were released and the Detroit Tigers were reformed on the 4th of December. Despite the changes the All-Americans succumbed to the Staleys 10-7. McNeill carried on believing his team were the Champions, believing they were undefeated on the season 9-0-2. The Staleys at that point were 8-1 in McNeill’s mind at least. Even if the loss had counted the All-American’s loss had counted it would wouldn’t have mattered to McNeill as they still had the better win percentage in either scenario. Halas however thought differently and scheduled to further games against the Bulldogs and the Cardinals winning the former and tying the latter. The All-American’s season ended on the 3rd December while the Staleys has continued two further weeks. By the end of the season the Staley’s record was 9-1-1. At the end of season championship meeting is where Halas won the league, in the vote for the season Championship by the owners. Halas, who was much more influential in the league than McNeill managed to convince the other owners that their exhibition match did in fact count to the standings. The league agreed with him, placing them with identical records (9-1-2 BAA) and (9-1-1 CS) with ties not counting. Halas held considerable influence in the league, which had voted a new commissioner who was still getting his feet under the desk. The belief is that Halas, who took hating losing to a new level was able to exploit the lack of leadership to convince the league despite points to the contrary. After winning the main battle the rest of Halas’s argument came down to semantics, one of which was pretty logical, insofar as the aggregate score between the two games was 16-14 in favour of the Staleys. The other more baffling point is that the second result was somehow important than the first one. The league agreed with Halas on both counts, oddly with special emphasis on the second part of this and not just the first and awarded the Championship to the Chicago Staleys. This was as close to the Championship the All-Americans would get, they would become the Buffalo Bisons in 1922 and McNeill would sell the team after the 1923 season. Had they not agreed to the game a day after their “final” game the argument would have been moot and the All-Americans would have been undefeated. Had the game been played according to McNeill’s stipulations the same would be true. Had the season ended after the All-American’s game against the Staleys they would have still been champions. The 1922 season would have a fixed beginning and end dates. Toes wouldn’t count to the standings until 1972. McNeill would go to his grave trying to persuade the league to over turn their decision. They haven’t.